Kath and Hanz in Bali. Image copyright Katharine Broughton 2015. I wrote the first part of this letter to you over a week ago, sitting at my desk thinking how can I possibly go on holiday. There felt like too much to leave behind. But in reality there is never a good time, and it’s just a holiday—two weeks. Life as I know it will go on. It’s almost a year to the day since we left Auckland for our three-month adventure to Wanaka and so much has passed since then. I wish I could tell you I’ve achieved the mindfulness I had so promised myself. Who am I kidding—the big smoke of Auckland sucked me back in: traffic, business, people. Like Alice in Wonderland I was back down the rabbit hole. So here I am now in Bali wondering if I’m any the wiser. Dear friend, after a week I’ve slowly peeled away the stresses of our Auckland life. We’re a family again. I’m a wife and a mother engaged in conversations, laughing, playing, giving each other time. My mind is here; for a week now work checks in behind rather than in front of my family. We’re staying in a villa just north of Seminyak. It’s very private and, aside from a wretched rooster who too-frequently graces us with his presence, it’s perfect. Coco lives in the pool, next to which I lounge, with a book, in a strategically-placed deck chair. I finished Stoner, what a brilliant piece of writing. So sad, yet he knew what his life was. Our days follow the same pattern: between waking and sleeping we visit beaches, have a massage, drink a cocktail or two, and generally hang out. Having been to Bali five times, everything is familiar. It is a lot cleaner than in past visits and there has been some money spent on the infra-structure of some areas, especially Seminyak where footpaths have been repaired and rubbish cleaned up. However, beyond this area it’s still incredibly run down—rubbish litters the streets and you soon realise that a lot of Balinese families live in poverty. A new find this trip has been Cangu beach. It’s popular with surfers and the waves closer to shore are great for Coco. She’s happy body surfing and if we’re lucky she finds a friend to play with. I’ve tried my hand, once again, at surfing; the waves at Cangu are ideal for beginners. I read somewhere, I think it was Adriana Huffington’s Thrive, that we need to let go of things we think we should do, but can’t or don’t have the time to. Surfing is one of those things. Each time I give it a go (and there have been many) I wonder why I keep trying. I stand up one out of five times. I catch a wave, I fall, I paddle back out, my arms hurt. This time, sitting on my board bouncing over the white caps I tried to find a surfer’s tranquility. It didn’t come. I tried again, I fell. Finally I gave up. I’m just not that good. Despite the desire to be a surfer this is something I need to let go of. She’s somewhere out there amongst the surf…! Image copyright Katharine Broughton 2015. The following day we took a day trip south to Pedang Pedang—a beautiful golden sand beach hidden at the bottom of a steep crevice tunnel. The water was crystal blue, the only shame being the layer of scum that sat above the waterline at high tide. It’s shameful how humans have destroyed such beauty with their waste. I hired a paddle-board and found my groove. 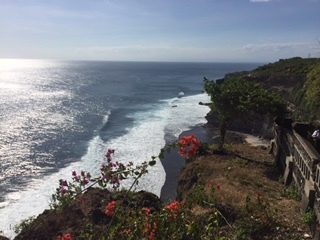 The views of the Indian Ocean from the Ulawatu temple were extraordinarily breathtaking. It’s hard to draw ourselves away. We finished the day with a cocktail at the Bulgari. It’s probably the only Bulgari we’ll get to visit in our shorts and jandals, for that matter ever, and for a moment we feel just like the rich and famous. So that ends our first week. How’s your family holiday? More adventures to come. Hi hon Hope you’ve had a great week with the family. 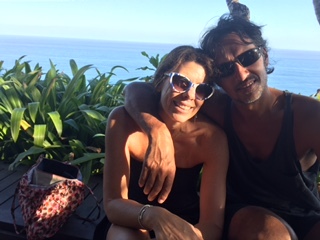 We’ve had an absolutely wonderful time… Will be hard to leave. On that note we’re waiting for details on our flight as a volcano is currently erupting in Jakarta and bali airport is closed. Ironically this happened to us five years ago leaving bali a volcano erupting in South America caused havoc to our journey home! This one is a bit closer.